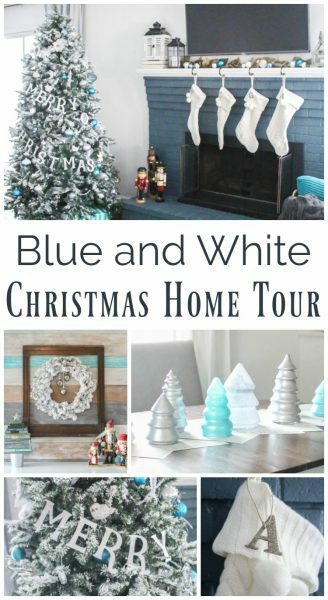 Blue and White Christmas Home Tour - Lovely Etc. 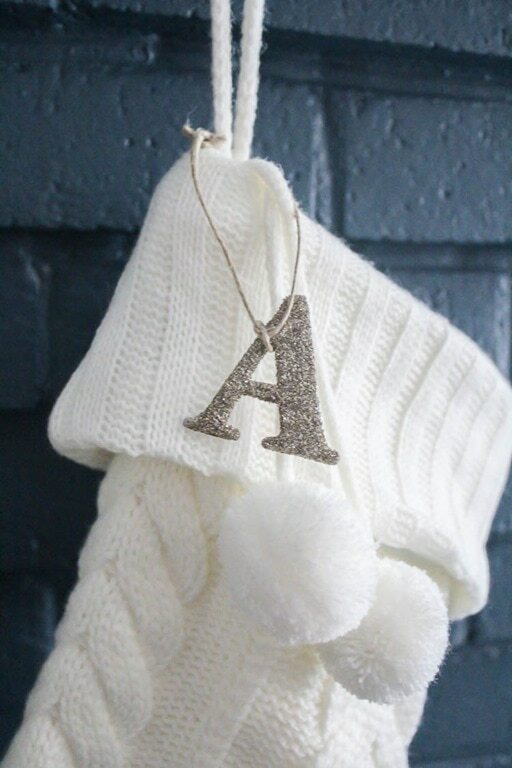 It’s finally here – Christmas decorating time! This year I decided to change things up. 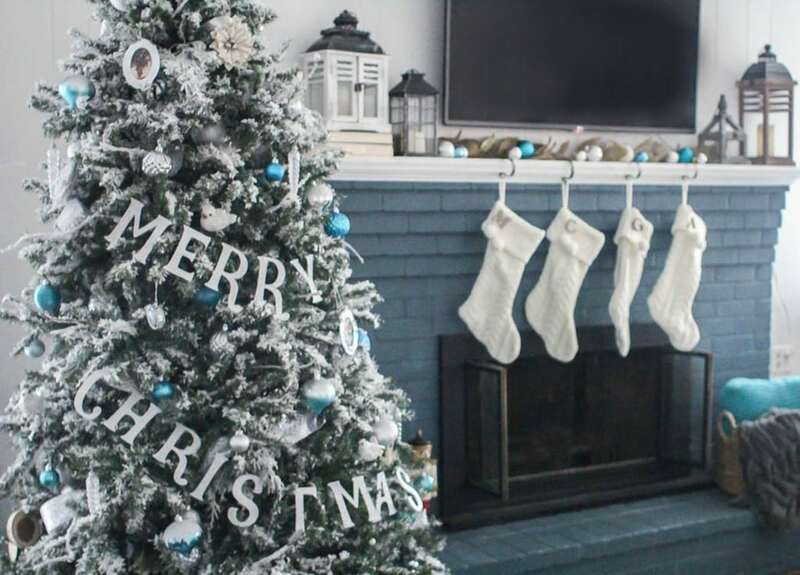 I skipped the traditional red and used lots of blue, silver, and white Christmas decorations and I love how beautiful and glittery it all is! But don’t worry if you are looking for more traditional decorating ideas – I’ve also gathered some of my favorite bloggers with all kinds of creative ideas and styles to share their Christmas homes as well. Now on with the tour! 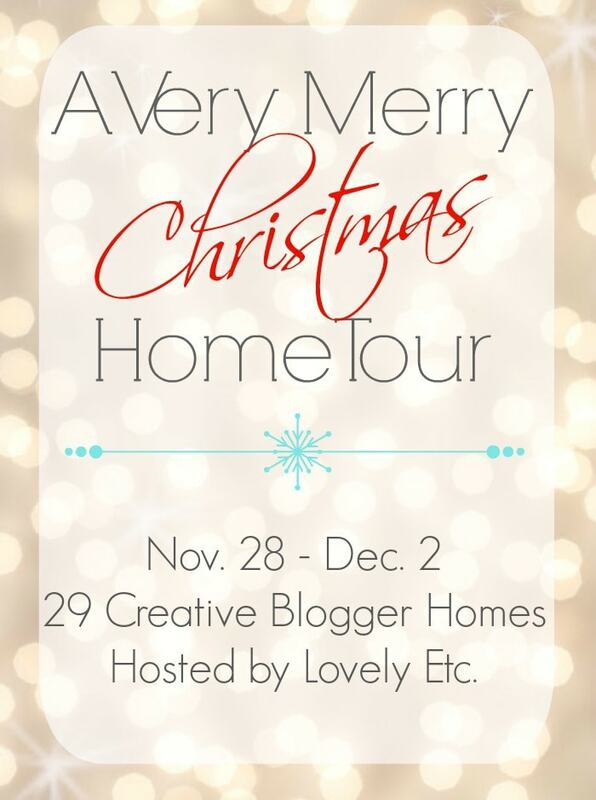 Welcome to our Christmas home! 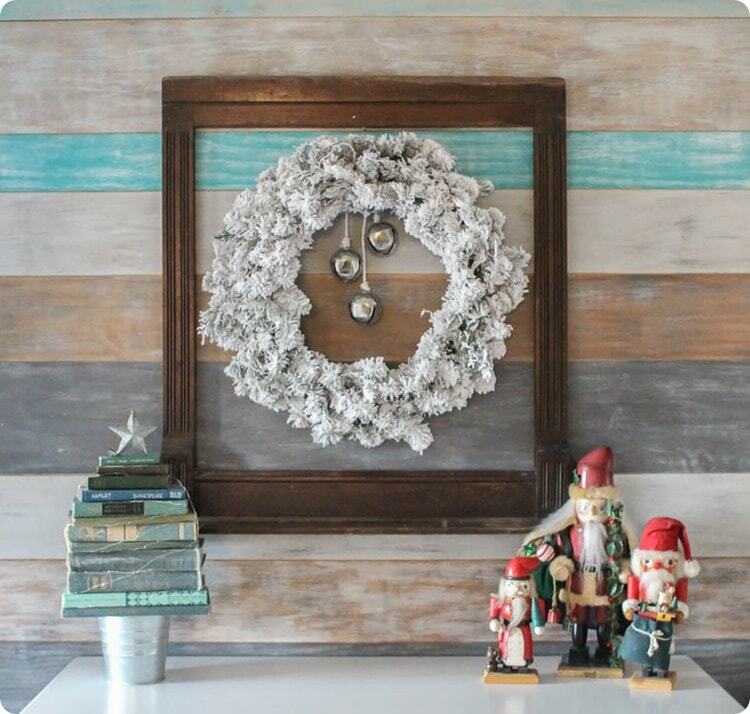 The best part of the foyer (other than that pretty plank wall) is my newly flocked wreath. It was a super simple DIY project and you can check out the full tutorial here. It looked a bit lonely on its own, so I hung it inside an old mirror frame that I found at a yard sale this summer for $1. They make a perfect pair! I’ve seen several Christmas trees made from vintage books and this year I just had to make one of my own. It was so simple. I grabbed a stack of old books with greenish covers and stacked them up from largest to smallest. I used a simple little bucket as a stand and added string lights and a small star and it was perfect! There is something about old books that I just find beautiful. I added a few nutcrackers as well. My husband has a huge collection of nutcrackers that was started by his grandmother and that we continue to add to each year. Some years we put out all 50 and some years I just choose a few favorites like these Santas. Ok, so I said the entry was my favorite, but the fireplace and tree may just also be my favorite. I can have two favorites right? It’s like children – they all really are your favorite! 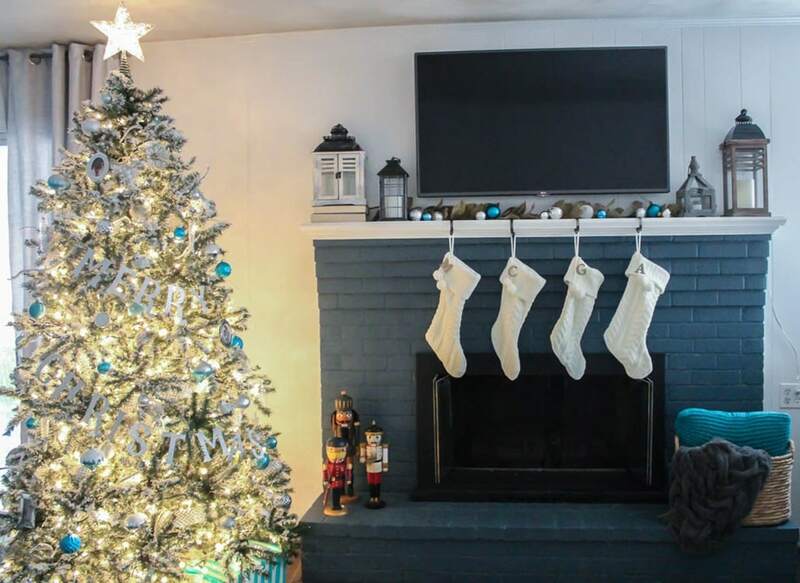 This was my first time decorating for Christmas since I painted the fireplace blue and I had so much fun. 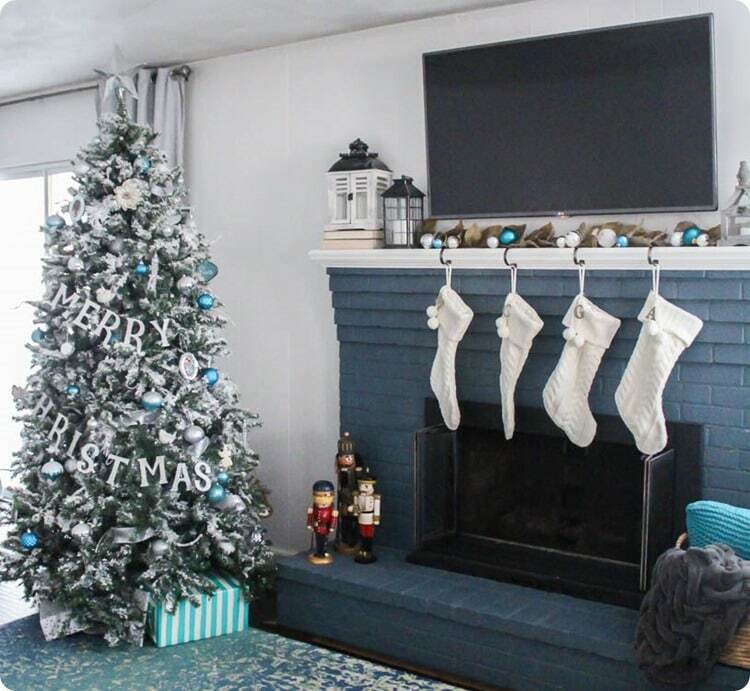 The fireplace was really the jumping off point for the whole silver and blue color scheme. It just looks so beautiful together! The white stockings are the only new decor I bought this year. I love how striking they are against the blue. Since they all look alike, initial tags were a must so everyone would know whose is whose. I simply added German glass glitter to some chipboard letters and hung them with twine. Once the ornaments were on, the tree needed something a bit more, so I cut the Merry Christmas banner from glittery cardstock. 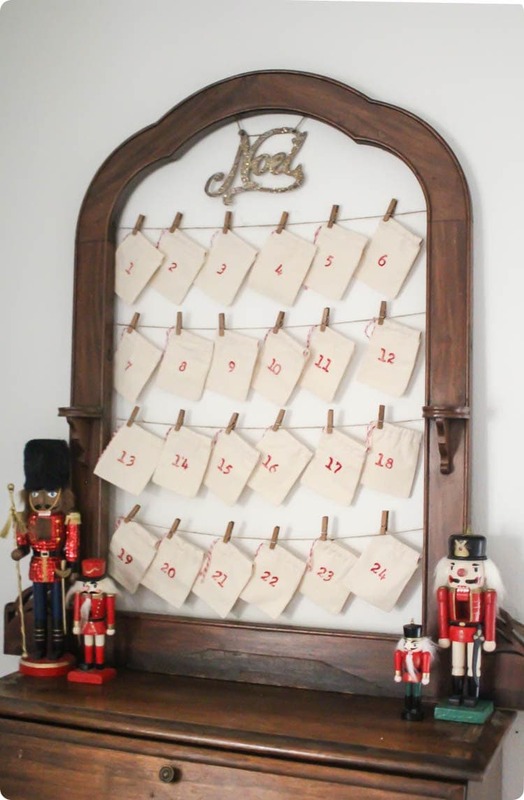 And the final touch – my upcycled advent calendar. And that’s my home! Thanks so much for visiting. Now I’m ready to cozy up by the fire with a cup of hot chocolate and watch some Grinch! 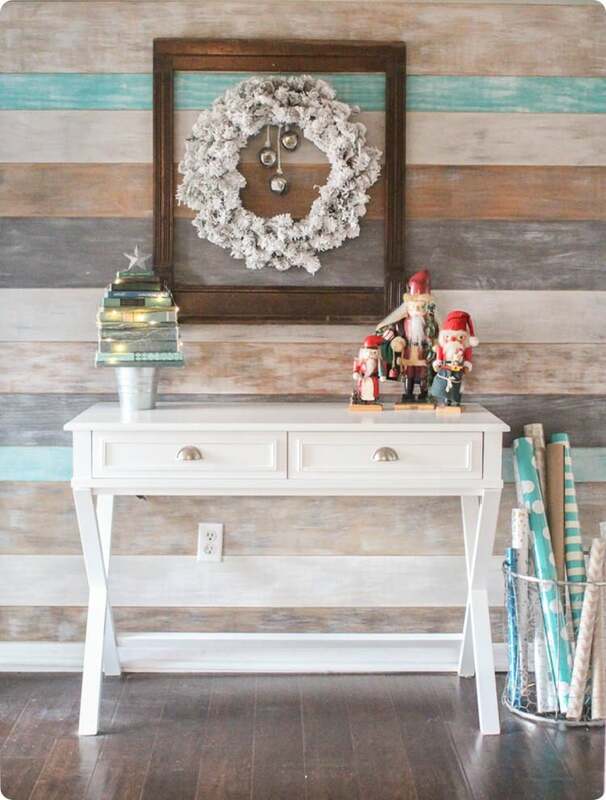 Ready to see even more beautiful Christmas decor? Check out the links below – there will be new homes to see every day this week. 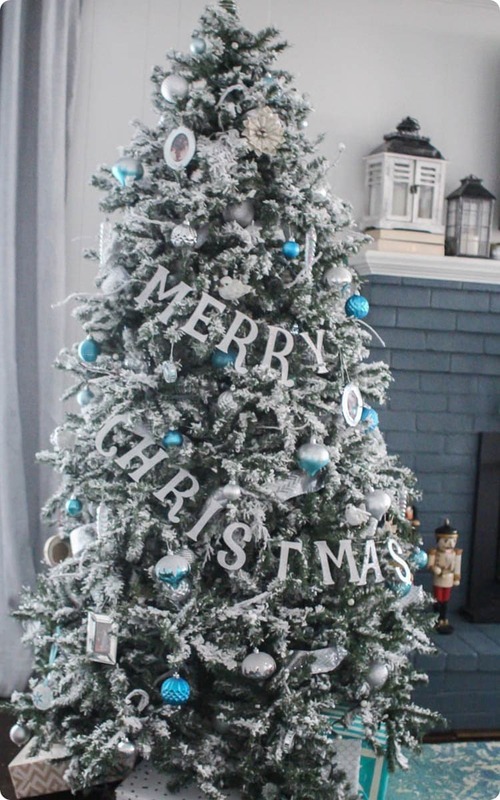 The flocked tree never gets old and all of the blue and silver looks stunning on it. Everything is so magical. Beautifully done! Thank you so much Erica! I really love that flocked tree! Thank you Karen! That mirror frame was such a lucky find! 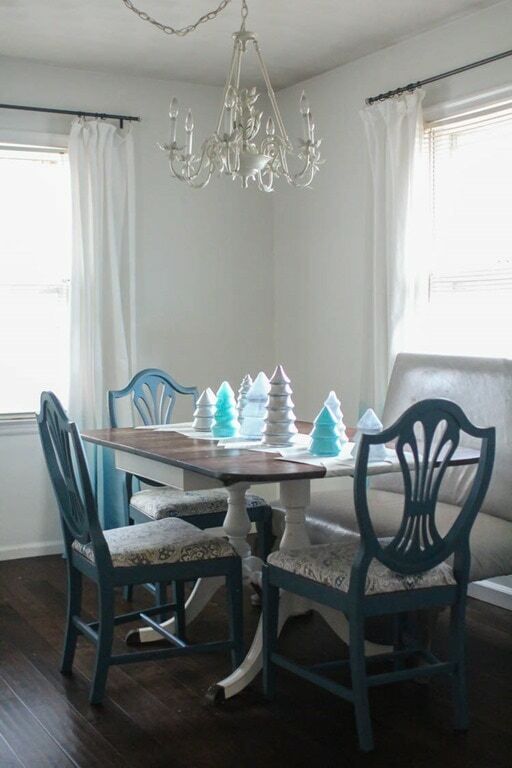 I love that you were table to incorporate blue into your Christmas decor. So many stunning details, it all feels so cozy. The Christmas tree is beautiful with the words on it, what a great idea! Oh my word, I love it all. Like, big puffy heart love. The blue and white and silver – just perfect for the season. I love that flocked wreath and the tree – my parents always flocked a real tree at the holidays and it was so elegant. Yours is lovely. You have me thinking I need to flock something now. Thanks so much for hosting. I’m loving all the inspiration. Thank you so much Kim! I think everyone should flock something – it is addicting! Thanks Nancy! 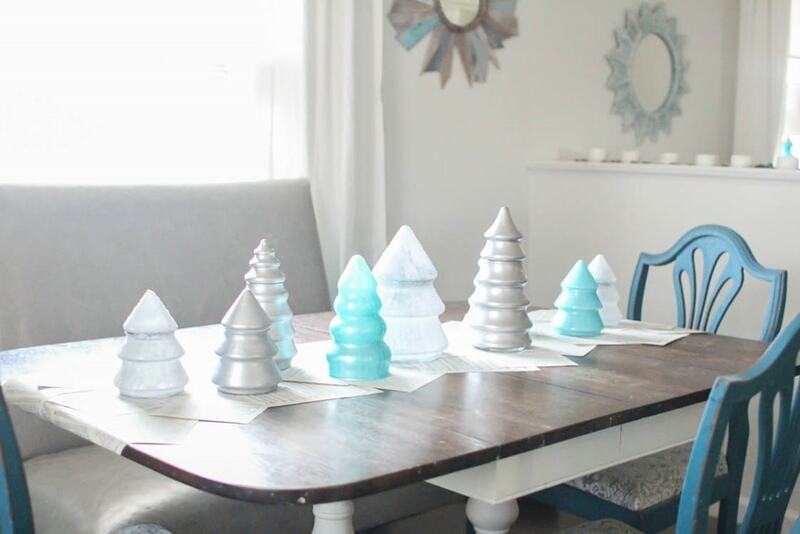 There is a tutorial right here: https://www.lovelyetc.com/diy-flocked-christmas-tree/ It is so easy to do! your tree is stunning!!! 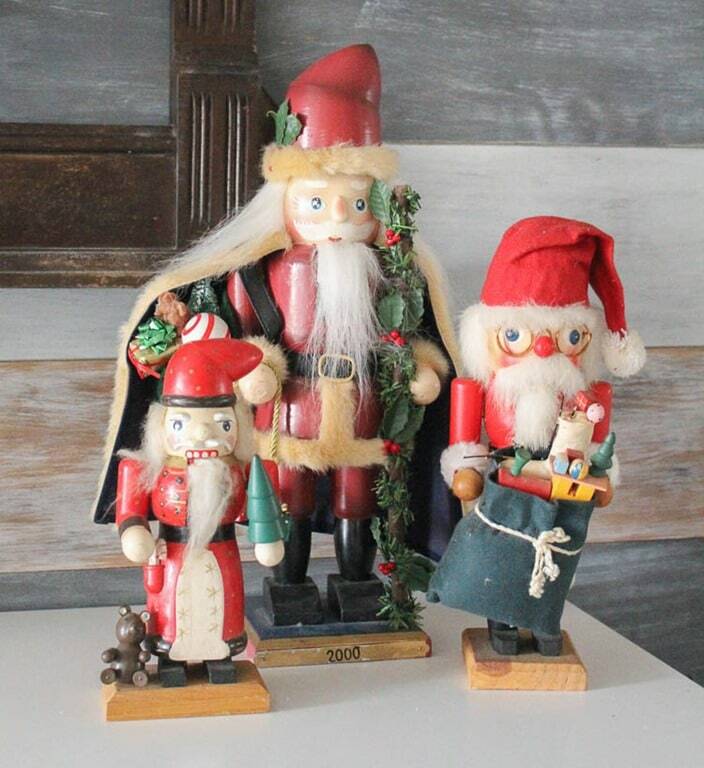 and we have a very similar vintage santa nutcracker! Thank you Cassie! We have so many nutcrackers but the Santas are my favorite! Thanks Gretchen! 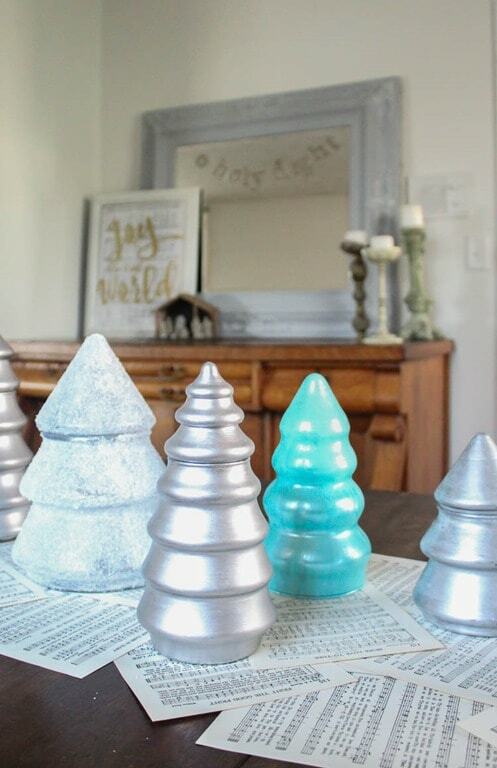 I definitely hear you about not having time for all of the ideas – I had about ten more ideas for Christmas decorating but at some point I had to just say that’ll do! Beautiful, Carrie! I can just go on and on about everything I love!! That advent calendar is perfection ;) And the flocked wreath, and the fireplace…and I have those same stockings! Loved it! Thanks so much Alicia! I’m loving these stockings! Such a pretty Christmas tour Carrie! Love the nutcracker collection and I can’t believe you found that mirror frame for $1!!! Thanks Tara! It was definitely a steal! I’m definitely trying the cute Christmas jar collection – what a simple but stunning display on the table! Beautiful job! Thanks Corey – it was really so easy and inexpensive! I love your Christmas Tree so much! The flocking and Merry Christmas banner are just so perfect together. Thanks so much for hosting! So beautiful Carrie, I really like your advent calendar and the nutcracker. They remind me of growing up in Germany. Thank you Betty! I have seen a few German nutcrackers that are simply amazing, but I can never afford them! Your home is so pretty! Love the vintage book Christmas trees and your living room is so warm and inviting! Have a very Merry Christmas! 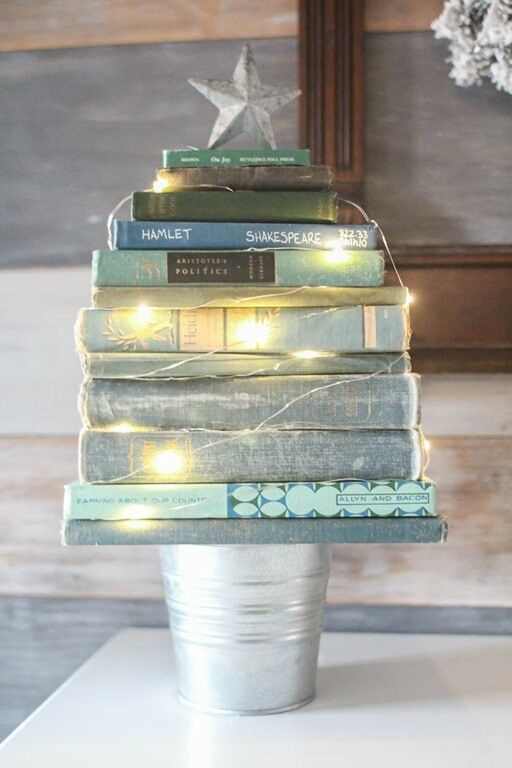 Love your vintage books and string lights! Gorgeous vintage Christmas! Love the blue and white Carrie! 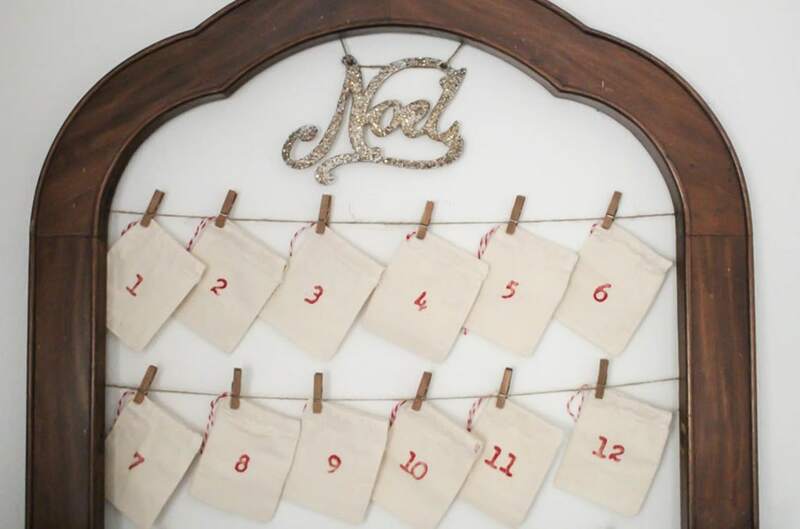 That advent calendar made me stop in my tracks, so pretty! 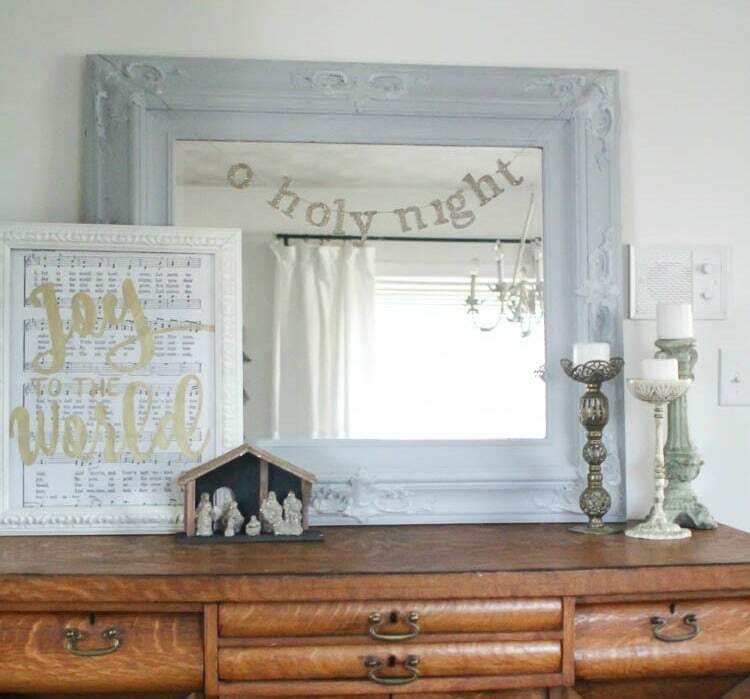 Love love love the advent and that mantle! I absolutely love your book “tree”. That would be perfect on my card catalog. My other favorite thing is your Merry Christmas banner on the tree. We have a travel themed tree this year and now I’m wondering if I could somehow add Bon Voyage to my already decorated tree! Ooh, a book tree on a card catalog sounds perfect and I absolutely love the idea of a travel themed tree! Bon Voyage would be perfect. I love all the blue colors! I am so excited to be the winner! I did respond to your email. Thanks again, and Merry Christmas! Thanks Diena! I always love finding a new DIY friend! Beautifully done Carrie! I have always loved blue and white for Christmas, those were my favorite colors. Love your Advent calendar and that adorable Book tree. Thank you Linda! I love blue and white all year long and I agree – they are wonderful at Christmas too!